To the young activists who nominated her, Maria Jimenez is a role model and mentor, the “go-to person” for strategic advice before engaging an immigrants’ rights battle. To advocates at the ACLU and Mexico’s human rights commission, Jimenez is a respected colleague who authored their recent report on the 5,607 deaths caused by U.S. border security policies between 1994 and 2008. 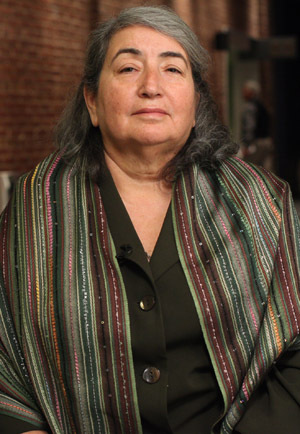 And to Concepcion Miranda, Jimenez is the “angel” responsible for her family finally getting their green cards, who not only empowered hundreds of undocumented Latinas to raise their voices and fight for their rights but convinced their husbands to allow them to travel to Washington to do so. As a child, Maria Jimenez left Coahuila, Mexico, with her mother and siblings to rejoin her father in Houston. Exposed for the first time to segregated playgrounds and buses, threatened with expulsion from school for speaking Spanish, Jimenez began to study political science, her major at the University of Houston. After graduation, she spent a decade in Mexico, promoting economic development there and giving birth to her twins. When she returned to the U.S., the 1986 Immigration Reform and Control Act had encouraged a new generation of immigrants to trust the government. They began to buy property, invest in businesses and their children’s education and apply for residency and work permits in increasing numbers. Then the politics of the border turned ugly and the U.S. began to fortify its 2,000 mile southwest border – with lethal consequences. On May 20, 1997, 18-year-old Esequiel Hernandez, Jr., herding livestock near his home, became the first American citizen killed by U.S. armed forces since Kent State, when he was shot by Marines patrolling to interdict drug smugglers. Jimenez led a grief-stricken community delegation to Congress, the Pentagon and the INS. Shortly thereafter, the Defense Department – which had resisted being deployed to enforce immigration law – withdrew troops from the border. As the backlog of immigrants waiting for work and permanent residency under the 1986 law grew, Jimenez played a lead role in organizing thousands of these “late amnesty applicants” to file a class-action suit. With the courts about to rule in their favor in 1996, Congress stripped the courts of jurisdiction, leaving 400,000 in legal limbo, without working papers, facing evictions, deportation and separation from family members who were citizens. Jimenez mobilized the Association for Residency and Citizenship of America, whose grassroots chapters throughout the country intensified their appeals for a just resolution. In December 2000, the Legal Immigration and Family Equity (LIFE) Act was signed into law, keeping the promises made in 1986 — but doing nothing to address the status of the many who continued to migrate over the border. When Houston’s day laborer centers were shut down out of political expediency, Petra Fellow Pablo Alvarado called on Jimenez to rally their leaders to assert their right to work. When reliable research was needed for a national summit on Latino worker health and safety issues, the University of Texas’ School of Public Health asked Jimenez to lead the team. Today as the police ostensibly target illegal immigrants convicted of crimes, Houston residents who are the most vulnerable to drug gangs, human trafficking and domestic violence avoid law enforcement and live in fear. Maria Jimenez remains on the front lines, keeping the faith with her community, tirelessly training new leaders and building the alliances necessary to win the long struggle for rights and dignity.